Take over the vacation house and gardens at Victoria Garden Estate for a break to remember. Our Victoria getaways are a chance for a group to retreat from daily life and have fun and relaxation (and catch up on news). Soak in the hot tub, sip wine in the gazebo, relax in the gardens. The house, with its seven bedrooms, has rooms for group activities or quiet times. 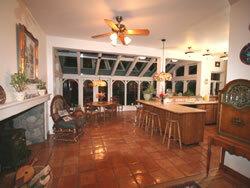 Prepare meals in the large professional kitchen or dine out at nearby restaurants. We are located in Deep Cove on the Saanich Peninsula on Vancouver Island, just north of Victoria. The house in 13 acres of gardens is surrounded by forest, close to the Saanich Inlet. There are great hiking and cycling trails in the area, the ocean is a short 15 minute walk away and you can buy fresh farm produce down the road. “It was such a wonderful weekend. Lots of relaxation, great food and friends and comfortable sleeps. The gardens are fantastic and inspiring. You really feel away from it all here. Thank you so much for letting us use you beautiful house. 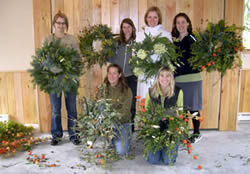 We will be back!” - one of the women’s group retreats in 2008.